﻿ PhotoMann Travel Photography - Who is PhotoMann? PhotoMann Travel Photography features pictures from 30+ countries around the world. I am PhotoMann (a.k.a. Doug Mann). I'm an American engineer currently living and working in Misawa, Japan. 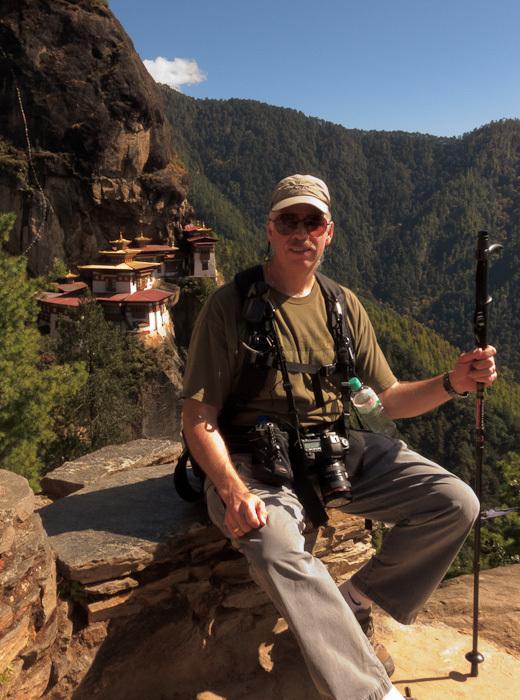 Prior to relocating to Japan PhotoMann at the Tiger's Nest in Bhutan. in July 2001 I lived in Wiesbaden and Berlin, Germany, as well as Okinawa, Japan. I have traveled extensively for both business and pleasure. In November '98 we added Chanapa to our family. She provides a continual challenge and of course a great photography subject. Chanapa was joined by our son Taksin who was born in January 2003. The two together are more than a handfull! I hope you enjoy traveling the world with PhotoMann. Many of his early images were shot as 35mm slides. My primary film body before converting completely to digital was the Minolta 9Ti (Titanium version of Minolta 9). The slides are scanned using Nikon's line of Coolscan's. My current one is the Coolscan V. In Nov 2003 I made to tough choice to change 'religions' and switched to Canon digital SLRs. My inital one was a 10D. That was followed by the Canon 20D, 5D and 5D Mark II. Now I'm shooting with a Canon 5D Mark III. I'm really pleased with the performance of Canon digital cameras. I also use a Canon G1X Mark II when I don't want to carry all my gear. I shoot mostly in RAW and convert to JPG for the web as necessary. Converting to all digital for my travel photography has been a great experience overall. The biggest benefit is having instant confirmation that I probably have the image I want versus waiting for film processing after I return home. I no longer have to worry about the impact of xrays on the tons of film I used to carry. However, now I have to worry about storing the many gigs of images on the road. 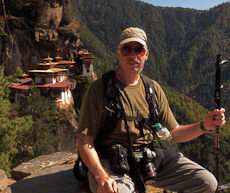 On my trip to Bhutan I shot 70+ gigs! I backup my CF cards to an Epson P-5000 and to an external drive with my laptop.